I’ve said it before, but I will say it again: multifaceted pet toys are probably the best thing pet owners can have. It’s fantastic to be able to give your dog hours of playtime while also serving a purpose. Sometimes it’s even more helpful for the busier pet parents among us. 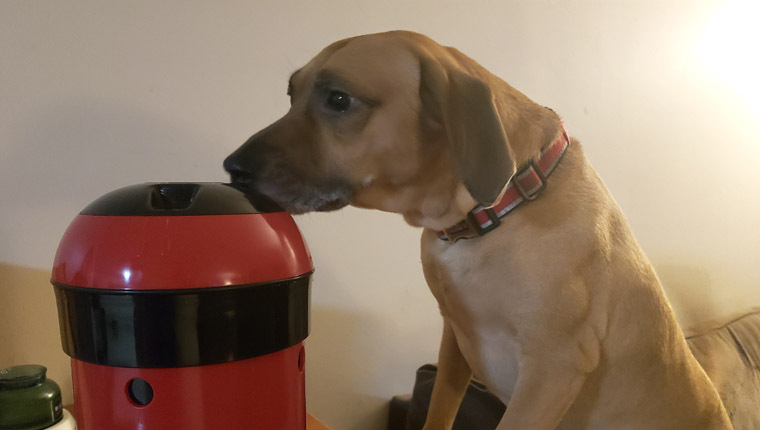 That’s why I was very excited to get the opportunity to review the Pipolino pet feeder. Intended for the dog that has the bad habit of eating too fast, this product instead distributes food as your dog plays with it. It also comes in a variety of colors and sizes. Best of all, it’s perfect for just about any dog. They even have a model for cats! You can check out the full variety of Pipolino products on their Amazon page here. The Pipolino pet feeder is very straightforward. Once you’ve purchased the correct size for your pet, it’s as simple as opening it up and filling it with your pup’s favorite dog food. Be sure to adjust the feeder accordingly. One twist from the top will shift the interior walls of the feeder and open more holes in the sides for food to come out. This allows for minimum or maximum distribution of your dog’s food as you see fit. You can adjust the number of openings if needed. However, keep in mind that it’s easier to make adjustments with the food removed. Afterward, you just roll it around on the ground and let gravity and your furry friend do the work. You don’t need to fill your Pipolino all of the way. One to two scoops–depending on the size of the feeder–should be more than sufficient. I threw two scoops in, slid the topper closed, and let Chance have a ball. The model that I got was a little large for my 40lb Beagle mix. However, I opted for the most durable version, as I anticipated Chance would get impatient with his food. I’m pretty certain that was a good decision on my part, as the Pipolino survived this past week with minimal damage. 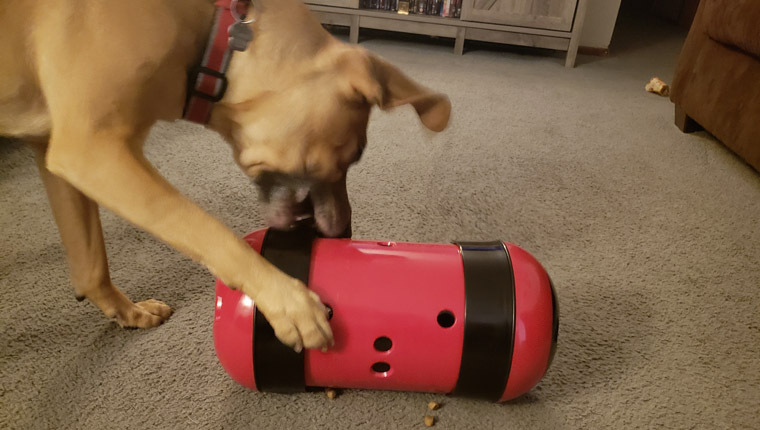 While he did manage to figure out how to open it once, he still had a lot of fun playing with this new toy. I personally like that the Pipolino makes Chance work a little harder for his food. It also keeps him active, which is its own reward. I would avoid making this your dog’s main method of feeding, however. At least while they get adjusted to the Pipolino feeder. If you find your pet isn’t taking to it as fast as you like, try filling it with treats, first. This will encourage interaction with it and enforce that the feeder is used for food in their mind. Overall, I really enjoyed the Pipolino, and it’s probably going to be a gift in the near future for some friends. If you’re looking for a way to help your furry family member (of any size) eat smarter and healthier, I recommend trying out the Pipolino. The writer of this review received no financial compensation from the makers of the Pipolino feeder for any opinions expressed in this article.